A life, or an experience such as the trip I’ve just taken, is woven of many strands. You can’t take a bunch of those strands, spin them all together, and tell all the stories at once, though I feel that that’s pretty much what’s happened to me. No, if you want to be intelligible a little sorting is needed. I’ll start at the beginning–and the ending, because one strand flows through the two camps that began and ended my trip. I flew against the sun to a place I had never been before, places my people had come from so long ago that I don’t know exactly where or when it happened. Those strands are broken, and I was not able to pick them up and spin them back into my life. But the land had plans for me, and new threads to be taken up. I spent my first night in Sussex, sleeping with the solid earth beneath me, and hazels and hawthorns sheltering me from the rain that had kissed this land with green. So green. California is hot and dry in September, the hills shining gold and beautiful, and needing only one spark to erupt in flames. When I come down from the hills at home, I smell of Lugh, dry grass and sunlight and essence of summer. In Sussex we burned logs so large some had to be carried to the fire by two people. The sparks climbed to the sky and fell on the damp grass and no one thought anything of it. I was enchanted–I do love fire. We sang and danced and drummed around that fire for hours. I shared some of my songs, and heard some of theirs, and while I arrived a stranger, when I left Anderida I was a part of what we had shared. The same constellations wheeled above Sussex as they do in California, and now they have additional names: Corona Borealis is Caer Aranrhod (The Fort of Aranrhod), Lyra is Telyn Arthur (Arthur’s Harp). The Milky Way is Caer Gwydion (The Fort of Gwydion), and Cassiopeia is Llys Don (The Court of Don). So I began the trip by putting my feet solidly on the land and looking up at the sky. One of the things I wanted to do on this trip was go to a Druid camp. Anderida Gorsedd just happened to be held the weekend I arrived. It turned out to be all that I’d hoped for and more. The story we worked, the Fourth Branch of the Mabinogi, was one I thought I knew. I’d read it multiple times, in multiple translations, had taken a Celtic Literature course from a wonderful and inspired teacher that worked with it–but I only knew the sequence of events! I was shown so much in such a short time, and I will never look at the Mabinogi the same way again. It took its place beside the Tain and the other Irish tales as part of my heritage, and it shaped and changed the trip, setting the stage for all the experiences to come. I had also wanted to be in the biome the ogham was created in. There was enough woodland at Anderida to give me a taste, and to begin my education. September really was the best month to come. All the trees were in fruit, and I was able to see them in ways that wouldn’t have been possible in spring. The good people at camp were patient with my constant questions– “what is this tree? What does a blackthorn look like? Can you eat sloes, hawthorn berries?” By the end of the weekend the trees were beginning to emerge as distinct entities, and I had most of the ogham woods I needed to complete my set of feda. My baggage was full of sticks and berries, my heart was full of new names and faces. My kettle, bought so I could have hot drinks, was unused. There was always a kettle on, and these people know the meaning of hospitality. My first morning I was made a perfect cup of tea with milk and sugar. My first night the sweetness of the mead poured into my cup mirrored that of the people I shared it with. I also had a ride to the train station, and went off to London to spend the night before catching a train to Scotland. I met Kristoffer Hughes at Anderida. He brought the Fourth Branch to life for me. I have only scratched the surface, but what wealth there is there! There is nothing–nothing–like learning from a native speaker and a scholar, who has read these tales in the oldest shapes we have, who understands inspiration and mystery and is in love with the beauty of these tales. He told me about another camp in Wales, conveniently on the last weekend I would be in the UK. It would involve going to Wales, however, something I hadn’t planned on. I hadn’t planned anything after Dublin, actually, and now I knew why. On the ride, the penny was dropped. 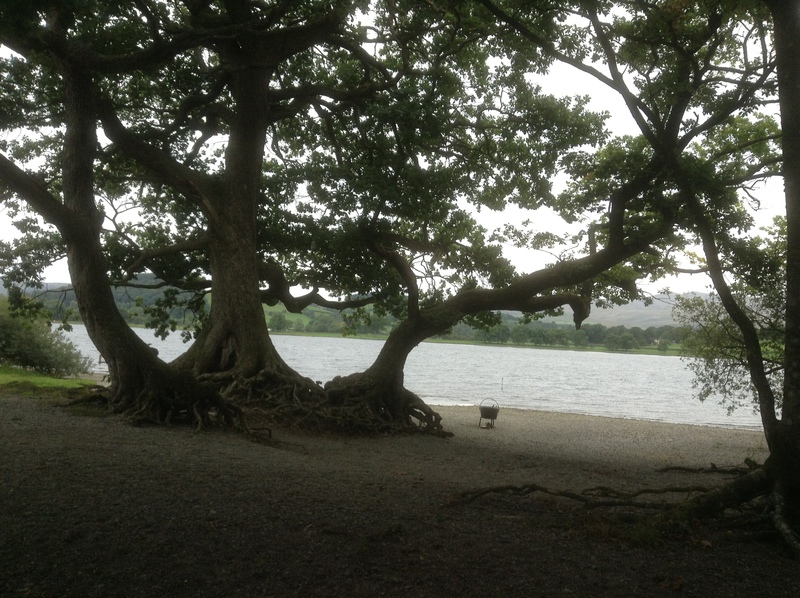 Bala Lake is Llyn Tegid, the place where the myth we would be working–the story of how Cerridwen brewed the Awen and Gwion Bach became Taliesin–had happened. I had been so caught up in making travel arrangements, getting into the camp, and traveling that this had escaped me. And Bala Lake was a name that meant nothing to me. A pretty place, an experiential camp and more inspired education courtesy of Kris Hughes–sign me up! I felt as if I’d been presented with the treasures of the Otherworld, and something more. A shiver went up my spine. This was the very same story we’d worked at the only Witch Camp I’d ever been to. I knew I was in the lap of the gods. I’d been brought here, and had taken on a lot more than I expected. There were friends from Anderida here. It was easier walking in to some faces I knew, and everyone was just as welcoming. We came in at the tail end of the witches’ tea party, which was a great way to meet people. Real china and Welsh cakes. As a matter of fact, I didn’t even need a kettle at Llyn Tegid. These folk actually did Anderida one better. In the marquee was a large gas fired kettle of hot water, teabags, and milk and sugar. All the little milk and sugar packs I had assembled in various hostels and takeaway places went unused. I finally had to jettison them when I was getting my gear down to baggage allowance weight. Llyn Tegid is Otherworldly. The lake is prone to flooding and the roots of the trees are exposed, twisted into weird shapes and disappearing into a soft gray shore of rounded stones and dusty soil. It looks as if the trees walk around at night when no one’s looking, and perhaps they do. It is as strangely beautiful as Mt. Tamalpais back at home, another sacred spot that looks as if it is half in another reality. The trees of the ogham are of course everywhere. I went looking for another spot like the one I had at Anderida, and found it. I slept tucked under two hawthorns and a hazel, the shingle was so soft it conformed to my body. It was a lot more comfortable than most of the hostel beds with my thermarest pad. It was warm enough at night to sleep with the top of the bivy sack open, looking up at the stars filtering through the leaves, listening to the lake lapping against the shore. All too quickly the weekend was over. I have a yearlong relationship with the cauldron to develop, and songs to write, and songs to perfect. And this was only one strand of the tale! If you are curious about the ritual work, or about the tales associated with it, the information can be found in Kristoffer Hughes’s book From the Cauldron Born. I’m devouring it even as we speak. It deserves a prominent place on any Pagan or Celtic Studies bookshelf. It will give an acquaintance with the relevant source materials to the one, and the flavor of experiential practice to the other.